This book is such a good example of why I love historical fiction. Historical fiction can take the liberties needed to craft a really excellent story, while still teaching me a little about the lives and actions of past history. For me, nothing makes things like love or loss ring more true than when I’m reading it in a historical context. McCabe does a truly wonderful job of making all that happen in this book. I Shall Be Near to You is clearly well researched, but you’re not overwhelmed by facts. The book isn’t about the Civil War in of itself; it’s about Rosetta. She’s a feisty woman who wants nothing more than to run a farm with her husband, Jeremiah, a local boy she’s loved forever. Their lives promise to be happy, if it weren’t for the war. Rosetta’s voice is incredible. McCabe does a wonderful job of using language of the time and of Rosetta’s upbringing (which would have consisted of only an average education). But her farm-like manner doesn’t hinder the reader from seeing how strong, resourceful, and passionate Rosetta is. And never, not for one moment, do we doubt her love for Jeremiah. Romantic as it is, this isn’t a book for the weak of stomach or for someone who doesn’t have any tissues handy. 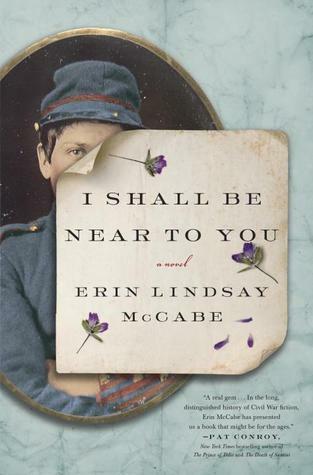 About half of this book takes place marching or on the battlefield and McCabe provides us with a myriad of visions, sounds, and smells (especially smells!) of what is going on. It’s gut wrenching and I guarantee you heart is bound to break. In all honesty, I didn’t think what happened was going to happen and I was astounded when it did. I think it was best for the story, but I can tell you it was not what I wanted. What can I say? This is a great story and adds just a little to what we know and think of when it comes to the Civil War. An excellent read.